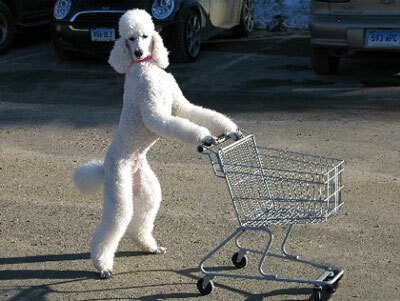 We welcome you to PUDELZ an exclusive Collection of Clothing, Gifts and Accessories for Poodle Lovers. The collection was started in 1997 to fill the need for high quality Poodley merchandise that you will be pleased to own and proud to give as gifts. We are all about Poodles and only Poodles and continuously look for new beautiful or clever merchandise so that you will consider us your #1 Stop when shopping for anything Poodley. We would like to tell you a little about us. Behind this fun web site is a devout poodle lover her 7 year old standard poodle, Jeanna (Unique Skye Daydream Believer) and the newest addition to our family Eliza Jane. Since PUDELZ is operated out of my home Jeanna, Eliza Jane and I spend a lot of time together. Jeanna – Our girl about town, Miss Congeniality, your personal shopper, always ready to go to the seasonal Farmer’s Market. She was a show dog for a short time until keeping up with her very very thick coat became a chore for us both. She is now one of my assistants and by my side with her sister Eliza Jane whenever I get up out of my chair for any reason. Known by name at the Bank, Post Office and even at the Local Nursing Home where I drive them once a week, she urges me to walk quickly across the parking lot so she won't be late to see her friends who are residents of the dementia unit. The residents are gathered in the common room and she circulates, off lead to meet and greet one and all and to share her wagging tail and poodle smile. she and Jeanna know exactly where the special cookies are kept. 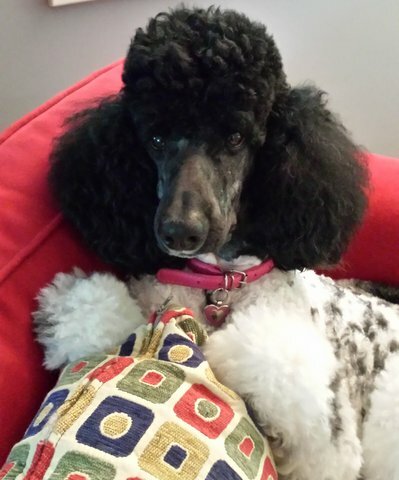 After 5 months of being trained by Jeanna, we think that Eliza Jane is ready to step into the position of PUDELZ Customer Service Poodle. She has learned the PUDELZ product line completely and is ready to help PUDELZ customers with any questions they may have about the PUDELZ Collection.